In the trailer for the new film Tony DeLap: A Unique Perspective (which I highly recommend), the artist notes: “I don’t want to minimalize anything; what I want to do is complicate it.” So while DeLap, over his enormously successful fifty-plus-year career, has been grouped into the Southern California minimalist crowd, along with artists such as Larry Bell and Robert Irwin, his work is, indeed, playfully complex, tricking the eye and redefining the space it inhabits (the artist’s interest in architecture does not go unnoticed). He does use a little to do a lot. This show is testament to that; it features a sampling of new paintings along with several works from years back. They range from a wall sculpture, the finely crafted Bluely-bluey (1992). The cuteness of the title is right in rhythm with the jaunty feel of this work, but belies its bold, even presence (the work is large, measuring 87 3/4” x 47 1/4” x 9”). Small collages and a drawing add depth to this sampling of DeLap’s masterful creations. Working with precise lines that form exacting shapes, each in a single, flat tone, DeLap works his well-honed vocabulary of color play magic, so that his two-dimensional canvases appear to be moving into three-dimensional space. 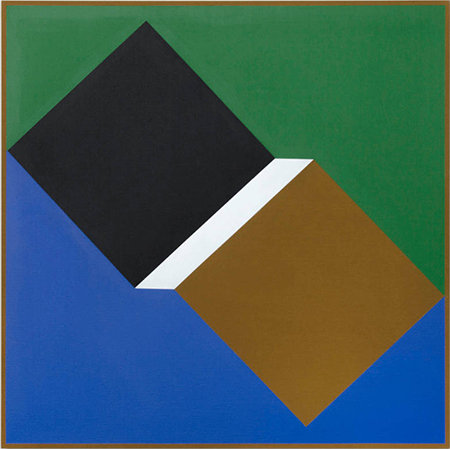 Such is the case with Card Trick (2014), in which two squares, one paper-bag brown and the other black, separated by a white parallelogram, bisect the canvas diagonally; the remaining spaces above and below are green and blue, respectively. The work, like all of the pieces in the show, is mesmerizing, and delivers the endless joy of knowing your optics are being taken for a ride. Stepping into the gallery to view new paintings by Jake Longstreth, the first impression is of their atmospherics, which is a bit surprising. Previous work by this Los Angeles–based artist had tended toward bright colors and sharp lines with no visible brush strokes. These new works are much softer by comparison, with more muted, earthy tones. Brushstrokes abound, to such a degree at times, they hint at the pointillist work of Seurat; in other instances, the strokes are more bulbous, recalling those of Philip Guston. 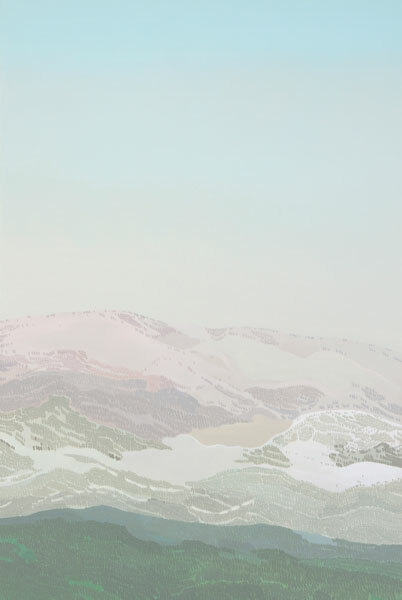 The nine works that comprise this show — all of which are vertical, measuring as large as 60” x 40” and down as small as 17” x 13” — depict naturescapes; there is no sign of human touch. In some works the serenity of the scene is disrupted by a fire, with a large plume of smoke rising into the sky. The works feature either hillsides to mid-canvas or foliage down low; the rest of the picture is open sky. Common to all of the works is a gentle glow, almost to the point of vibrating. Of special note is Free Range, the title piece of the exhibition, and one of the hillside paintings. Starting at the bottom, the ground changes in patches from a shadowed green, to light green, white, and pink tones — the style brings to mind Wayne Thiebaud. A definitive line marks the transition from ground to sky, the latter gradually transitioning from a hazy white to light blue. Looking across Longstreth’s work over the past decade, these pieces mark a new phase, demonstrating this artist’s ability to stretch his talents into new styles, with clear success.